Home Uncategorized Brother, can you spare $49,665,810,000? Brother, can you spare $49,665,810,000? Quico says: According to people idle enough to actually keep track of these things, in the first half of the year the Chávez government announced plans to spend at least $49.7 billion dollars on projects abroad. I write “at least” because the figure doesn’t include the many, many foreign spending promises made “loosely,” without announcing a specific price tag. 49 billion verdes is about one and a half times the government’s total (oil and non-oil) revenue over that same period: these guys are literally pledging the country’s money away faster than it comes in. It’s hard to get a gut level feel for exactly how much money $49.7 billion dollars is. To give you a sense, here’s what $206 million (mostly in $100 bills) looks like. Now, the government has, on average, been pledging to spend this amount of money abroad every 21 hours. Indeed, between January and June, the Chávez government pledged to spend this amount of money 240 times over on projects abroad. 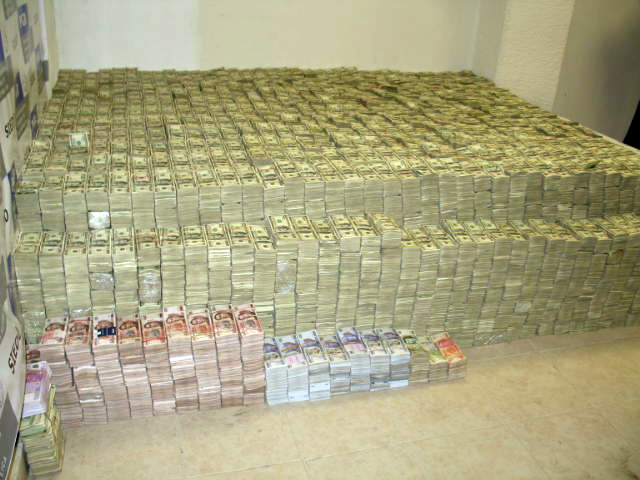 Actually, I propose the Mexican Drug Cash Pile (MDCP) as the standard unit of account for Bolivarian Foreign Spending. The conversion rate would be 206,000,000 $ : 1 MDCP. Bolivia got pledges for 6.4 MDCPs worth of new spending (mostly for energy exploration,) China 9.7 MDCPs (new refineries), Argentina – 15 MDCPs (for bonds), Cuba 21.9 MDCPs (for all kinds of stuff) , Russia 22.3 MDCPs (weapons), Nicaragua 23 MDCPs (refinery), and Iran gets a scrumptious 43 MDCPs (for super secret stuff). But it’s Ecuador that tops the bill with a whopping 46 Mexican Drug Cash Piles worth of new spending: some 9.5 billion of your and my dollars to build a shiny new refinery at Manabí. Now, does anyone actually follow up on these pledges? Do they ever get audited? How many of these projects will actually get built? And, erm, how many “commissions” can you pay with 49 billion bucks?